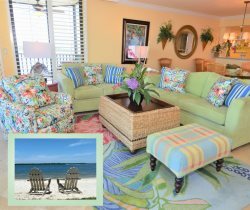 Professionally decorated and renovated (Fall 2018) vacation rental with wrap around balcony and expansive views that compliment the tranquil coastal decor. The view reaches up the San Carlos Bay and across the back bay areas offering complete seclusion. Upgraded throughout featuring granite countertops, a large walk-in master shower, custom master closet and split floor plan. This unit would suit those on a working vacation as it offers a work desk and plenty of natural light. You may have found this rental on HomeAway 4363817, HA ID 4363817, VRBO 4363817ha or Vacation Rentals 4363817. Kara and Kelly were amazing. omgoodness there are no words. The unit looks EXACTLY like the photos. Awesome views, every amenity in the unit. So thoughtful to leave/provide floaty air mattresses, shelling tools, sand pails, body boards. beach umbrella and chairs, plenty of reading materials, excellent notes in unit on how to work everything. Saw dolphins from the lanai. Everything imaginable that you could want for in the unit. Pool and spa incredibly clean. I am a clean freak and this exceeded my expectations. All instructions for check in and check out very detailed. We did not want to leave! Will be back again. Thank you for all your attention to detail! The team was great. My sisters and I had a wonderful time. Everything was wonderful, we enjoyed our stay very much. Directions to the tv would be helpful for future guests, also window screens and windows that would stay open in the small bedroom. More dishes and a wine opener and a better can opener. Loved the view , decor and the location of this property. Very friendly and responsive. We had a couple of small maintenance issues in the unit which we suggested be fixed for the next guests. Thank you...just made reservations for next year. This was our 2nd stay at your property! We absolutely love the place and unit 717 is a perfect "haven". The unit is beautifully decorated and the views were awesome. We are sold and will be your guest again! Upon check out we needed to have our airline tickets printed. We did not expect this service but we had our tickets printed in hand and given to us with a smile. We also had our questions answered fully about what condos are presently for sale. This location is the BEST!! The Corner Condo we stayed in was fantastic. Sitting on the recliners in the screened in porch with water on three sides made us feel like we were on our own private quiet island. Thanks to the owners who shared this condo with us for a short period of time. It helped us decide that Resort Harbour Properties is where we would like to consider our search for a vacation property. We're great. Printed our boarding passes. At my request showed me other condos. We love the property . This was our 3rd year and plan to return . We are retired and love the tranquility of the resort. I don't think we would want to be there in the busy season. Exceptional hiring practices because everyone we came in contact with was friendly, helpful and courteous. We were made to feel very welcome and comfortable! Our experience in Harbour Towers 717 could not have been any better! The condo was as beautiful as it was comfortable! We had everything we needed for a full weeks stay with a surplus of bath and beach towels, soaps, detergents, bath emminities and fully stocked kitchen. We were treated so well by every staff member we came in contact with for the condo as well as the resort and various restaurants on the property. Being able to take a short walk to the Courtside Steakhouse was so lovely we ended up having dinner there multiple times. Checking our calendar now for when we can reserve the place again!